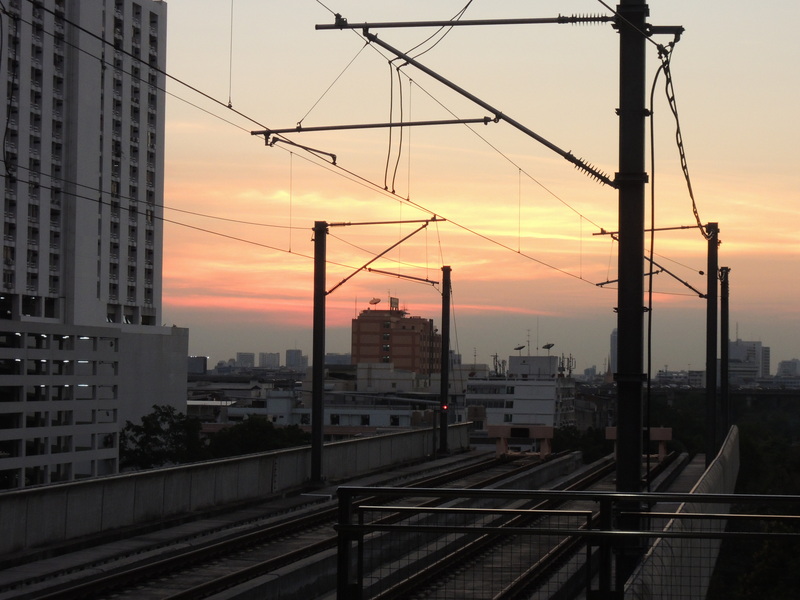 Sunset from the platform at Phaya thai Station. Two planes, a train, and a thrilling (terrifying?) moto ride later, I’ve arrived in Bangkok. Let the mayhem begin. It’s been a quiet month, both here at Enter the Gaijin, and in my actual life. Last week, I watched my second class of Kazusa students graduate from junior high school. The ceremony was much the same as it was a year ago, when I wrote about it in some depth, and while I didn’t feel compelled to chronicle it online again, I think I appreciated the day itself more this time around. The graduating students were ones I taught for almost two years, ones I knew by name and personality, students that I actually feel comfortable considering my own. For the graduates, last week marked the end of an era, and next month–when they matriculate at their respective high schools–a new one will begin. And although I have four months left on my JET contract, I must admit it felt like an end of sorts for me, too. As this school year draws to a close on Friday, it’s hard not to see the next few months as anticlimactic. Of course, there is plenty to get excited about: new students will arrive, as will new teachers, with the drama of school transfers (which I also discussed at length a year ago) playing itself out over the days to come. And yet, because I’ll only be around for the first trimester of the new school year, I feel a bit like a lame duck making the rounds on an extended farewell tour. More and more, my thoughts have begun to gravitate towards the next step, life after Japan. There’s a good reason for this: I’ve heard back on all my graduate school applications and am now faced with a decision, one which I will make public in a few weeks when it is official. With this in mind, it’s understandable that I’ve become increasingly preoccupied with plotting out my next move. In fact, given the logistics involved in my upcoming return to the U.S., it would be problematic if I weren’t beginning to think about it in earnest. But even so, I am fighting the urge to indulge in such thoughts, because they are contrary to the way I strive to live my life here: one day at a time. I know I have been successful in this so far because I still wake up some mornings and find it surreal that I am here. That it’s been almost 20 months also seems hard to fathom, not because time has flown by, but because of how conscious I have been of its passage since arriving here. But rather than run out my remaining time here with one-foot-out-the-door and eyes on the horizon, I am trying to stay in the moment, to relish the everyday adventures that brought me here in the first place. But while everyday adventures are well and good, when life becomes routine, we sometimes require an actual adventure to snap things back into focus. On Saturday, I fly to Thailand, where I plan on scratching that itch with the help of some familiar faces from back home. Assuming we all live to tell about it, you can expect some new posts as the page turns to April, though I can’t guarantee that all the content will be fit for general audiences. Enter the Gaijin? No, no, no. Enter the Fegos.